He then broke down some stats: compared to “industry benchmarks” (i.e. run-of-the-mill display ads), AOL is seeing 6.4X the engagement rate with Project Devil ads than standard ones (10 percent versus 1.5 percent engagement), 1.9X the click-through rate, and 3.4X the time spent with the ads for those people who do engage (47 seconds versus 14 seconds). Project Devil video ads are played twice as much as other video ads. AOL needs as much bang as it can get. In the first quarter, AOL was still fighting a 17 percent decline in total revenues, with the subscription business down 24 percent, and search and contextual ads down another 21 percent. But there was one bright spot. 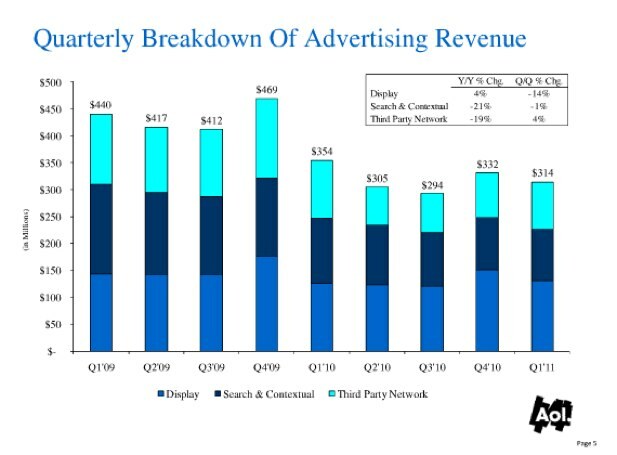 Display advertising looks like it may have turned the corner for AOL, with 4 percent revenue growth overall and 11 percent growth domestically. Project Devil is a part of that. AOL eliminated 55 percent of its ad impressions by cleaning up its pages, and revenues still grew. The flip side of that is attracting a bigger audience on the content side. AOL si now the No. 2 online video publisher in terms of unique viewers. The Huffington Post alone grew 27 percent in unique visitors during the quarter from December, and Patch grew more than 100 percent off a small base (total unique visitors for Patch is now 6.5 million). The locally-targeted ads on Patch also do better than normal display, but that is another story and Patch still has a long way to go. AOL’s new initiatives with Project Devil, Patch, and video are promising starts. Now Armstrong needs to scale them up.